Would buy again from the seller. The item arrived. Everything OK. Thank you for the bussiness. 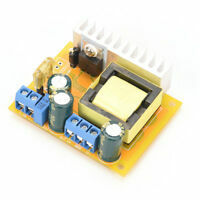 Be aware that this is not a regulated converter. Output is proportional to the input. That said, it was the least cost way to create a 900V source to replace battery packs in an old sensor. I used feedback to a programmable regulator feeding this to stabilize the output. That and a stepdown for the processing circuitry runs everything from a rechargeable 12V gel-cell. Made with high quality. Electrical parameters as written. I used to repair the oscilloscope.